Apple doesn’t make many Android apps. In fact, it only makes three, and two of them are music apps. 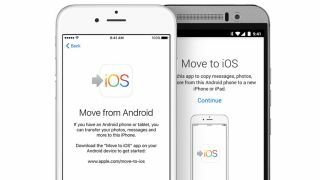 But it’s the third that’s the most interesting, because Move to iOS is designed to make swapping Android for iOS as easy as possible. Apple’s app was introduced in iOS 9, and it’s available for iPhones running that OS or later. It supports iPhones from the iPhone 5 onwards, iPads from the fourth generation, iPad minis from the second generation and the sixth generation iPod touch. On Android you’ll need to be running version 4.0 of Android or later. Don’t set up your iPhone or other iOS device until you’ve installed the Move to iOS app: it expects to see a factory-fresh (or at least, factory reset) device and it’s a pain to sort out on a phone or tablet that’s already been set up. Make sure both iOS and Android devices are plugged in, make sure your Android device is connected to Wi-Fi and make sure your iOS device has enough space: unlike many Android devices, which support extra storage via microSD cards, iOS devices’ storage is fixed. TechRadar's handy hint: Before transfer, clean your Android phone as much as possible. Delete any unwanted apps, photos and media - this is your chance for a 'smartphone spring clean' and you'll be surprised how many apps you rarely use when you think about it. Now you can start to set up your iOS device. When you get to the Apps & Data screen you should see an option to Move Data from Android. On your Android device, open Move to iOS and wade through the terms and conditions. You should now see the Find Your Code screen and a tempting ‘Next’ link. Tap on it. Back to your iOS device. You should now see a Continue link on the Move from Android screen. Tap on it, and you should now see a code displayed. You’ll need to give this code to your Android device. Once you’ve entered the code on your Android device you should now see the Transfer Data screen. This enables you to choose what content to transfer: the options include contacts, message history, photos and videos you’ve taken, web bookmarks, email accounts and calendars. Apple also tries to match free apps with their iOS equivalents if Apple-friendly versions are available. As you’d expect, transferring your stuff can take a while - and even when your Android device says the job’s done, the iOS device may still be showing a progress bar. Don’t do anything on either device until that progress bar has completed too. Once the progress bar finishes on your iOS device you can tap Done on Android and Continue on iOS to finish setting up your phone. That should be it... you might not find it's perfect, but you'll be a lot closer than if you'd had to start completely from scratch.